For example, by the 19-year metonic cycle, the full moon repeats on or near Christmas day between 1711 and 2300. A small horizontal libration is visible comparing their appearances. A red color shows full moons that are also lunar eclipses. 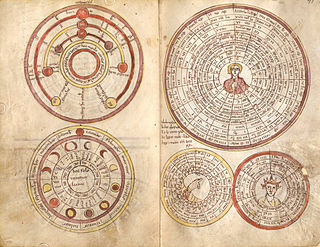 For astronomy and calendar studies, the Metonic cycle or Enneadecaeteris (from Ancient Greek: ἐννεακαιδεκαετηρίς, "nineteen years") is a period of very close to 19 years that is nearly a common multiple of the solar year and the synodic (lunar) month. The Greek astronomer Meton of Athens (fifth century BC) observed that a period of 19 years is almost exactly equal to 235 synodic months and, rounded to full days, counts 6,940 days. The difference between the two periods (of 19 solar years and 235 synodic months) is only a few hours, depending on the definition of the year. Considering a year to be ​1⁄19 of this 6,940-day cycle gives a year length of 365 + ​1⁄4 + ​1⁄76 days (the unrounded cycle is much more accurate), which is about 11 days more than 12 synodic months. To keep a 12-month lunar year in pace with the solar year, an intercalary 13th month would have to be added on seven occasions during the nineteen-year period (235 = 19 × 12 + 7). When Meton introduced the cycle around 432 BC, it was already known by Babylonian astronomers. A mechanical computation of the cycle is built into the Antikythera mechanism. The cycle was used in the Babylonian calendar, ancient Chinese calendar systems (the 'Rule Cycle' 章) and the medieval computus (i.e., the calculation of the date of Easter). It regulates the 19-year cycle of intercalary months of the modern Hebrew calendar. The start of the Metonic cycle depends on which of these systems is being used; for Easter, the first year of the current Metonic cycle is 2014. At the time of Meton, axial precession had not yet been discovered, and he could not distinguish between sidereal years (currently: 365.256363 days) and tropical years (currently: 365.242190 days). Most calendars, like the commonly used Gregorian calendar, are based on the tropical year and maintain the seasons at the same calendar times each year. Nineteen tropical years are about two hours shorter than 235 synodic months. The Metonic cycle's error is, therefore, one full day every 219 years, or 12.4 parts per million. 19 tropical years = 6,939.602 days (12 × 354-day years + 7 × 384-day years + 3.6 days). 235 synodic months (lunar phases) = 6,939.688 days (Metonic period by definition). 254 sidereal months (lunar orbits) = 6,939.702 days (19 + 235 = 254). 255 draconic months (lunar nodes) = 6,939.1161 days. Note that the 19-year cycle is also close (to somewhat more than half a day) to 255 draconic months, so it is also an eclipse cycle, which lasts only for about 4 or 5 recurrences of eclipses. The Octon is ​1⁄5 of a Metonic cycle (47 synodic months, 3.8 years), and it recurs about 20 to 25 cycles. This cycle seems to be a coincidence. The periods of the Moon's orbit around the Earth and the Earth's orbit around the Sun are believed to be independent, and not to have any known physical resonance. An example of a non-coincidental cycle is the orbit of Mercury, with its 3:2 spin-orbit resonance. A lunar year of 12 synodic months is about 354 days, approximately 11 days short of the "365-day" solar year. Therefore, for a lunisolar calendar, every 2 to 3 years there is a difference of more than a full lunar month between the lunar and solar years, and an extra (embolismic) month needs to be inserted (intercalation). The Athenians initially seem not to have had a regular means of intercalating a 13th month; instead, the question of when to add a month was decided by an official. Meton's discovery made it possible to propose a regular intercalation scheme. The Babylonians seem to have introduced this scheme around 500 BC, thus well before Meton. Traditionally, for the Babylonian and Hebrew lunisolar calendars, the years 3, 6, 8, 11, 14, 17, and 19 are the long (13-month) years of the Metonic cycle. This cycle, which can be used to predict eclipses, forms the basis of the Greek and Hebrew calendars, and is used for the computation of the date of Easter each year. The Babylonians applied the 19-year cycle since the late sixth century BC. As they measured the moon's motion against the stars, the 235:19 relationship may originally have referred to sidereal years, instead of tropical years as it has been used for various calendars. According to Livy, the king of Rome Numa Pompilius (753-673 BC) inserted intercalary months in such a way that in the twentieth year the days should fall in with the same position of the sun from which they had started. As the twentieth year takes place nineteen years after the first year, this seems to indicate that the Metonic cycle was applied to Numa's calendar. Apollo was said to have visited the Hyperboreans once every 19 years, presumably at the high point of the cycle. The Runic calendar is a perpetual calendar based on the 19-year-long Metonic cycle. Also known as a Rune staff or Runic Almanac, it appears to have been a medieval Swedish invention. This calendar does not rely on knowledge of the duration of the tropical year or of the occurrence of leap years. It is set at the beginning of each year by observing the first full moon after the winter solstice. The oldest one known, and the only one from the Middle Ages, is the Nyköping staff, which is believed to date from the 13th century. The Bahá'í calendar, established during the middle of the 19th century, is also based on cycles of 19 years. 11 years = 136 lunations within 1.5 days, i.e. an error of one day in 7.3 years. 8,497 lunations = 250,921.41 days. This gives an error of only about half an hour in 687 years (2.5 seconds a year), although this is subject to secular variation in the length of the tropical year and the lunation. Meton of Athens approximated the cycle to a whole number (6,940) of days, obtained by 125 long months of 30 days and 110 short months of 29 days. During the next century, Callippus developed the Callippic cycle of four 19-year periods for a 76-year cycle with a mean year of exactly 365.25 days. ^ Ask Tom: How unusual is a full moon on Christmas Day? ^ Livy, Ab Urbe Condita, I, XIX, 6.